Neil Everett, Nate Jones and Steve Anthony may be moving to Los Angeles in April. For every ESPN on-air personality like SportsCenter anchor Neil Everett, there are more than 10 behind-the-scenes employees who make the shows go. At least four of them are like Everett in that they have strong Hawaii ties. 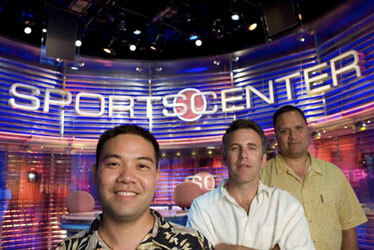 Director Steve "Kahuna" Anthony, is an 'Iolani graduate who has six Emmys to his credit in 23 years at ESPN. Mid-Pacific graduate Nate Jones is a rising star in the statistics and research department. Engineer Dory Kong from Kaimuki and graphics producer Ashoka Moore of Hawaii Kai are both Kaiser graduates and are also among around 5,000 ESPN employees. They are in the early stages of their careers in Bristol, Conn.
Several of the five could end up working together in Los Angeles, as ESPN plans to open an office there in April. One of its tasks will be production of the late-night SportsCenter shows. Nate Jones, Neil Everett and Steve Anthony have found a home working for ESPN in Bristol, Conn.
Bristol, Conn., can be a cold place. And the weather can get pretty bad, too. Steve Anthony, who grew up in Hawaii and went to college in California, remembers wondering 23 years ago what he'd gotten himself into when, as an ESPN rookie, he had to walk home 5 miles in 20-degree cold when his car broke down. "At first I really questioned myself and what I was doing. My degree from USC didn't mean jack here. I was really unhappy and very forlorn that I didn't know anybody here," he said. But Anthony, soon to be re-named by Chris Berman, stuck it out. Six Emmys later, the veteran director is among one of the most respected in-the-trenches leaders at ESPN. "I'm blessed with sharing in the growth of arguably the most successful story in broadcast history. If not, then definitely in the top five. I got lucky. This company was never satisfied with just surviving." 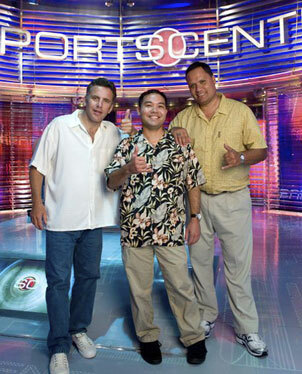 Anthony, along with several other ESPN employees, continues to bring a touch of the islands to "The Worldwide Leader." Before there was Neil Everett, there was Larry Beil (now working in the San Francisco Bay Area), and Everett has kept alive the tradition of using plenty of Hawaii references in his delivery as a SportsCenter anchor. Everett, 46, has been at ESPN since 2000, and has steadily risen to become one of the network's high-profile on-air personalities. But even though he is now a national sports media figure, Everett continues to have an impact on the Hawaii sports scene, and it goes way beyond the daily "Howzit" and letting everyone know what time an event starts, Hawaiian. Rob DeMello, reporter and weekend anchor at KITV, says he doesn't know what he would be doing now if not for Everett. When DeMello was between his sophomore and junior years at Kailua High School, a friend of his won a contest, with the prize being dinner with KGMB news anchor Kim Gennaula. Learning of DeMello's interest in sports, she got him in touch with Everett. At age 15, DeMello began learning from Everett. "It was great, and not just because I got to hang around the studio. Neil became like a second father. My grades went up, because he would check in with my teachers," DeMello said. "He never sat down with me and said, 'This is how you do it.' He told me to watch him, and then develop my own way. He's still one of my best friends, and even though he's in Connecticut we're as close as if he's still in Kailua." Everett is originally from Washington and Oregon, but worked as an assistant athletic director at Hawaii Pacific University before becoming sports reporter, anchor and director at KGMB, and lived in the islands nearly 20 years; it is clear his heart remains here. He finds as many ways as possible to keep his Hawaii ties strong; this past year he emceed HMSA's Kaimana Awards for high school scholar athletes, and in November will host Shane Victorino's charity golf tournament on Maui. He has asked to be one of the two or three anchors who will be assigned to ESPN's new Los Angeles bureau. "All I've asked is to be considered in the conversation," Everett said. "From what I hear, they're building a SportsCenter studio identical to the one in Bristol. There will be no discernible difference to the viewers." The difference for Everett is he'd be a lot closer to his homes -- in Hawaii and the Northwest. Like Bluto in Animal House, Chris "Boomer" Berman hands out names. You just have to hope you get one you like. "The first time I met Boomer I shook his hand and said, 'Pleased to meet you, I'm Steve Anthony. He said, 'No you're not, you're 'Kahuna.' And it stuck.' More people know me as Kahuna than as Steve Anthony." That was in 1985, and in the decades since, Anthony has lived up to the moniker. As a line director, he is the man who runs the show, with calm, expert authority. He's a wizard. When directing a SportsCenter show, he is the central figure in communicating with about a dozen other people, including those on-air, to make sure the show runs smoothly. On a big remote shoot, such as a Super Bowl, it might be two dozen. "He's a gentle giant Hawaiian. Not loud, but when he enters a room, he projects a presence. He's a real professional and very well thought of," Everett said. "Some guys get jumpy. That's a word that will never be associated with him." Anthony has the hardware to verify his reputation: six national Emmys. He is humble about his role in them, but proud, too. "It's a little nebulous -- in some cases, there are a couple hundred people who have the recognition," he said. But Anthony owns six; that means something. Which does he consider most significant? "Probably 1996, the first for SportsCenter as best daily sports news show," he said. "That was validation that our flagship show had arrived as the show of record." Anthony has watched ESPN grow exponentially, from scraping for programming into a billion-dollar-a-year, multi-media business. "The company was a fraction of what it is now (when he started). Over 5,000 employees now, a few hundred then. I started as a production assistant and worked my way up the ranks. We were doing Frisbee tournaments and Australian Rules Football," he said. "Two big things happened in the late '80s, a Texas against Texas A&M football game, and the America's Cup. We had exclusive rights to the America's Cup, and that put us on the map. Not long after that we got an NFL contract, and that made us relevant. I remember we all went next door to a place called the White Birch Inn and celebrated, because we knew it was a pivotal moment. All of a sudden we were a player." Anthony was a football player at 'Iolani, graduating in 1980. Then he got to see some great teams as a business student at USC. He's pondering a possible move to ESPN West in LA, but has some solid roots in Connecticut. His wife, Mary, is from there, and they own a beautiful home in New Haven. "It's an option, but I have my life here," he said. "For all intent and purpose, I'm as much a Connecticut Yankee as a Hawaii Kamaaina now. Exactly half my life's been here now." A career change isn't likely for Kahuna. "I enjoy what I do tremendously. I've been a line director for 12 years. In the back of my mind sometimes there's the thought of doing something else, but live national TV is so much fun. It's a blast, so much fun to do it's hard to imagine something else." If ESPN were a five-star restaurant, the on-air talent, the Boomers and Neil Everetts and Stuart Scotts, they would be the maitre d' and the superstar waiters and bartenders. The directors and veteran producers, they are the chefs. The youngsters in stats and research? They're the dishwashers. Now, that doesn't mean the next Bobby Flay won't emerge, but the odds are long and the work, though necessary, is often tedious and not always appreciated. "We're the agate clerks of ESPN," said Noel Nash, senior director of statistics and research. "We could have morale issues." One of the reasons they don't is Nate Jones, a 30-year-old Mid-Pacific Institute grad who came in at the bottom rung in 2005 and consistently climbed it, attacking any task handed him with unfailing competence and a great attitude. Like most young people in the broadcast business, he aspired to be on air. "I think I've found my niche. I like research, stats and facts. There's a lot of satisfaction in it. I'm glad I did get to learn some on-air stuff, at my first job in Seattle, and with Les Keiter (Stadium Stars program) in 2001. "What we do takes skill, too. Without the behind the scenes, there is no SportsCenter." Nash said Jones' "attributes are many." "His focus is incredible and it helps ensure the integrity of our data. Nobody has made fewer errors than Nate, by a large margin. His attention to detail and focus is phenomenal," said Nash, who heads a department of around 100 employees. "He's also a fantastic teammate. Others turn to him when they need help or they're down. He's doing the islands proud. It's hard for me not to rave about him." "If someone's having a bad day, I just try to help. I think it's just my nature," Jones said. "Probably part of being from Hawaii." After graduation from Oregon, Jones worked for a cable network in Seattle. He contacted Everett, who told him the process to try to get an interview and helped him along. Everett, who did not know Jones or his family in Hawaii, picked him up at the airport and let him stay at his home during the interview. "Neil's been an unbelievable friend. He's like family. He still looks out for me," Jones said. "And Kahuna is very well-respected here and also a good friend." Around 25 percent of the entry-level production assistants hired by ESPN don't make it past their first year, often not by their choice. "You're evaluated often, and after six months you might be asked to leave," Jones said. "Some leave on their own, because they just wanted to get ESPN on their resume." In the past couple of years, ESPN reorganized and consolidated its stats and research efforts. The department's motto is "Verify Like A Champion," Nash said. Jones may be doing his verification work in Los Angeles in a few months. "From what they say, it looks most likely, a hybrid role, statistics and bottom-line research," he said. This creates a quandary for Nash, and not just replacing the real-life Jones. "We encourage all of our employees to play in every company fantasy sports league, because it helps them in their job. One of Nate's things is that he likes to take pictures with celebrities. So if you win a league, you get your picture taken with Nate Jones, and it goes up on our Wall of Fame," Nash said. "I guess we're going to have to get a life-size cutout of him." Everett said Jones could be the kid who starts out washing dishes and ends up owning the restaurant. "Everybody loves Nate Jones," Everett said. "We'll all be working for him some day." Reach Star-Bulletin sports columnist Dave Reardon at dreardon@starbulletin.com.